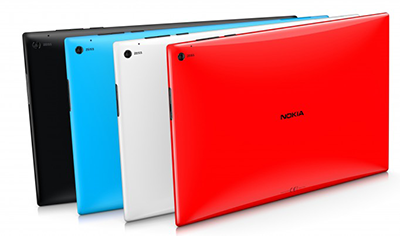 On the occasion of Nokia World Abu Dhabi, the manufacturer has introduced a high-end tablet Lumia 2520, on paper, has strong arguments. This is a product that we look forward to testing. While specifications and options announced by Nokia are confirmed, this Lumia 2520 seems to have some very interesting capabilities. The product should be available sometime in the fall first in the United States, the United Kingdom and Finland before opening other markets in stride. Operating under Windows RT 8.1, the Lumia tablet has a 10.1-inch screen resolution 1080 HD Gorilla Glass 2. The manufacturer claims the readability both indoors and outside all existing tablets on the market. Point should of course check and that is very important because unlike Microsoft Surface, 2520 Lumia offers to connect Wi-Fi and / or 4G. Both cameras are equipped with Zeiss optics, autofocus 6.7 megapixel front and 2Megapixels HD wide-angle rear. The possibilities are 1080 HD video at 60 frames per second. The tablet is equipped with a quad-heart Qualcomm Snapdragon processor 800 2.2 GHz (like the Lumia phablet 1520). The 8000 mAh battery offers. Microsoft Office is included as well as mapping application Maps and Nokia Music. 4 colors are available: red, cyan, white and black. Nokia finally boasts a very fast loading time: 80% in one hour. In addition to the tablet itself, Nokia offers an optional keyboard (150 dollars to spend in addition to $ 500, the base price). The keyboard has a trackpad and offers 5 hours and two additional USB ports battery. Of course, the question arises as to what will happen to such a product once the acquisition of Nokia by Microsoft has been finalized. 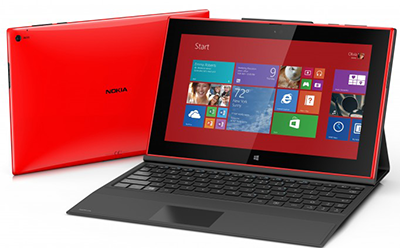 One of the two products (Microsoft Surface RT or Nokia Lumia 2520) will have to disappear. But, once again confirmed after tests, the Finnish manufacturer seems to have a strong case to make.